These days, there’s little sign that the Polish university town of Wroclaw was, in the 1980s, a byword for fierce anti-Soviet resistance. Instead, the most challenging task facing the day-tripper is just which of Nana’s tempting pastries to order. 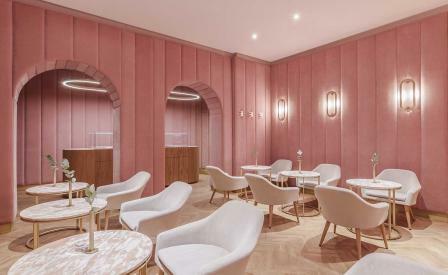 Buck Studio have converted a former nondescript cafeteria into a symphony in pink for pastry chef Justyna Kawiak’s new patisserie in the heart of Wroclaw’s medieval old town. The space is conceived around the elongated oval shape of an éclair. The curved walls and arched doorways lined with pink velvet are set off by the soft gleam of brass piping on high stools and light sconces. It is, however, difficult not to be distracted by the patisserie’s centrepiece: an island counter bejewelled with Kawiak’s pretty collection of salted caramel éclairs, and bijoux pastries festooned with lychees and mangoes, and scented with tonka beans and black sesame. Resistance is futile.